Drip Edge: A metal strip that runs the full length of the roof to direct water run-off away from the building. It also serves to protect the sheathing from moisture damage on the end grain. Fascia: A piece of material that covers and finishes the ends of the rafters. Usually made of wood the fascia board is generally where gutters are installed. Flashing: A piece of metal that prevents water ingress around an object that protrudes through or rests directly against the roof, such as a vertical wall, chimney or a vent pipe. Gable: The triangle shaped portion of the end of a building underneath the roof and above the main portion of the house. Hip: The external angle that is formed when two slopped roofs intersect. Rafters: Portion of the roof truss. Beams that run from the bottom of the roof to the top of the roof are termed rafters. 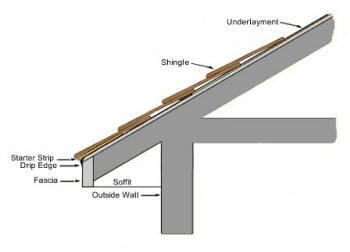 Ridge: The upper most point on the roof running the entire length of the roof. Sheathing or Decking: The material that covers the rafters, usually a wood based product, such as outdoor grade plywood or chip board, and provides the surface to adhere the roofing material such as slate, shingles, or metal panels. Soffit: The soffit is the material which is placed under the eaves and fills the area between the house and the end of the eves. Starter Strip: The first layer of shingles, which is installed in a reverse direction, placed at the edge of the eave to provide protection under the cutouts of the first course of shingles. Truss: The roof's skeletal structure. A grouping of beams, supporting the roof. Underlayment: Provides moisture protection. Usually termed tar paper it is either heavy felt paper or a synthetic composition material which is placed on top of the sheathing. Valley: The internal angle that is formed when two slopped roofs intersect create the feature known as the valley.